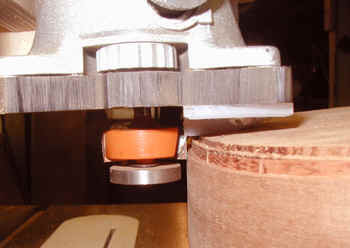 This is one of the cutters which I use to cut the binding ledges on my guitars. It is simply a cutter with a ball bearing pilot, and is made so that it cuts a ledge of a specific size. I have them made for me by a local machine shop. Although this is expensive, I find that it works better than the cutters which use a variety of different bushings on the ball bearing to regulate the size. Recently I have these made up by a company that I found on the internet - Orbittool - which makes custom cutters for routers and shapers. Their prices are reasonable and their work is excellent. This one is for the herringbone top purfling and cuts a ledge of .215" -- that is .080 for the binding and .125 for the herringbone. I size them to cut about .010 larger than the material being glued in. This allows for a small amount of sanding and scraping of the side without reducing the size of the binding. 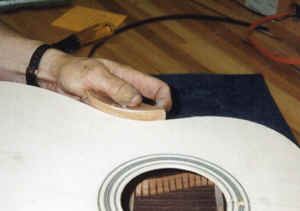 I have always felt that binding is one of the most important cosmetic elements on a guitar and if the binding is thin in some areas it will be immediately obvious and reflect badly on the instrument. This is another cutter, with replaceable bearings. It comes from LMI and has a variety of bearings to provide cuts from .060 up to .230 in increments of .010. Very useful. Because I use a side purfling which is mitered into the purfling at the end block (and on the points of a cutaway), I need a way to cut the binding ledge accurately to accommodate this. 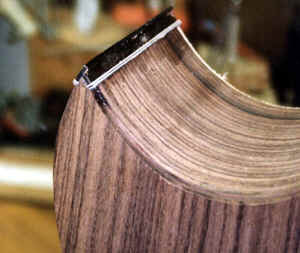 My technique is to put a shim under the bottom plate of the router that is the exact thickness of the purfling I use (.079). I then cut the binding ledge at the end block, remove the shim and recut to the full depth of the binding and the purfling. This really works quite well. Here the ledge for the binding has been cut. 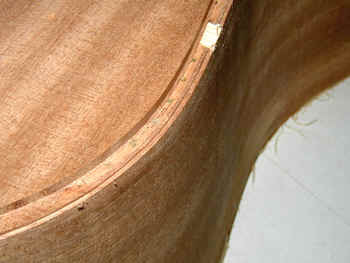 You can see that it is cut so that the purfling under the binding will miter into the purfling outlining the end wedge. I will cut out the excess side wood up to the purfling with a chisel and then cut the miters. More photos on this later. Here is the same thing at a cutaway. You can see the extra depth for the binding. I will carefully trim away the extra wood and miter the purfling to accept the side purfling. 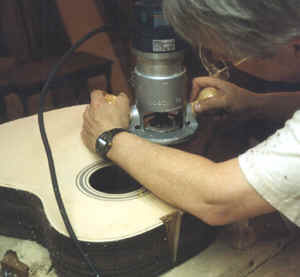 Here I am cutting the binding ledge on the top of a guitar. More of the same. 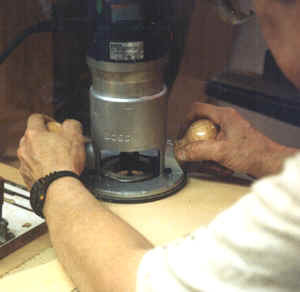 If the cutter is sharp, and I cut carefully, I get a ledge that is clean and needs very little extra preparation. Cutting the binding and purfling ledge for the back is considerably more difficult than for the top because the back is curved and therefore the router (and the bit) will not remain perpendicular to the sides. 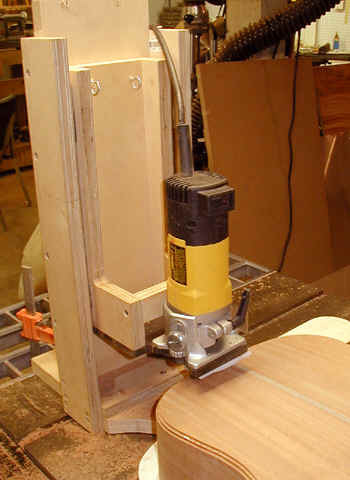 This tool (made to plans from LMI) serves to hold the router perfectly perpendicular to the sides. A small foot rides on the back to establish depth. Since it is quite small it is not significantly affected by the curve of the back and an accurate cut is made. The piece of the jig holding the router rides freely up and down using ball bearing slides for a drawer. 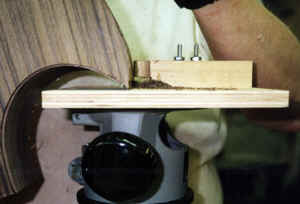 Here is a photo of the working parts of this jig, showing the foot that rides on the back. Another photo of the foot. Here the ledge for the purfling on the back has been cut - the binding ledge will follow. No matter how carefully I cut, there will be some spots on the top which are a little rough. This is because spruce is a very soft wood and because at some spots you are cutting "uphill" against the grain. . I use the edge of a very fine file to lightly file the edge of the binding ledge to smooth it out. For the inside curves where the file will not work, I have a small wood block which is curved to match the profile of the guitar and is covered with 150 grit sandpaper. This does the same job as the file. Cutaways present a special problem. 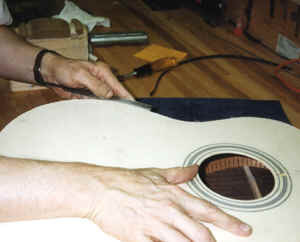 The point of the cutaway must be bound, but it is difficult to use my regular binding cutters. I made this jig which is attached to the base of my router. There is a 1/4" straight cutter below the follower which is visible here. The photo is fairly self explanatory as to how it works. 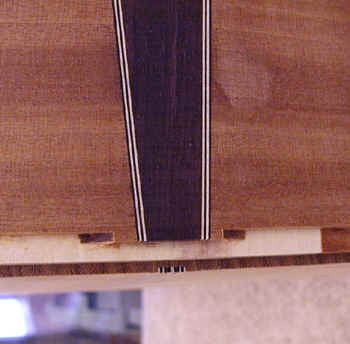 Here is the cutaway point with binding. I cut the ledge for the inside first and glue in the binding. then I cut the outside edge - this trims the piece on the inside so that it mates perfectly with the outside piece.